I have been so happy with my Fotoman's 6x9 camera, that when I got my first large format system, I decided to stick with Fotoman and get their 45SPS model. You may be wondering why I didn't opt for a normal style 4x5 with bellows. The traditional folding view camera is far more flexible, having more movement options and the ability to use lenses of many focal lengths. The Fotoman, in contrast, limits the degrees of freedom and allows me to work quickly in the field. For my style of shooting, I rarely have the time, or patience, for complex setups with swing and tilt. Using a 'point and shoot' style camera enables me to prepare multiple shots at any given location. To use, simply zone focus with the lens's distance scale (or use the ground glass), place a film holder, set the lens attributes and fire away. This is what is known as the large format "point and shoot". A fixed lens cone replaces traditional bellows to set the lens to film plane distance. These cones are generally made from machined aluminum. While metal adds weight to the body, the cones are durable and far superior in windy conditions. I decided to go with a 120mm lens for my landscape needs (lens conversion guide). The Fotoman will accommodate lenses ranging from the 47mm XL to a 150mm. Though, specific lens options are limited to Fotoman's recommended models. I stow the camera, with cone attached, in a padded wrap and place at the top of my bag. It's amazing how quick it is to grab and set up for a shot. This is where the point and shoot system shines. Chasing spontaneous light in nature is a big contributor to the landscape photographer's struggle. The bonus of using a fixed body is that the number of items on your mental checklist gets reduced. 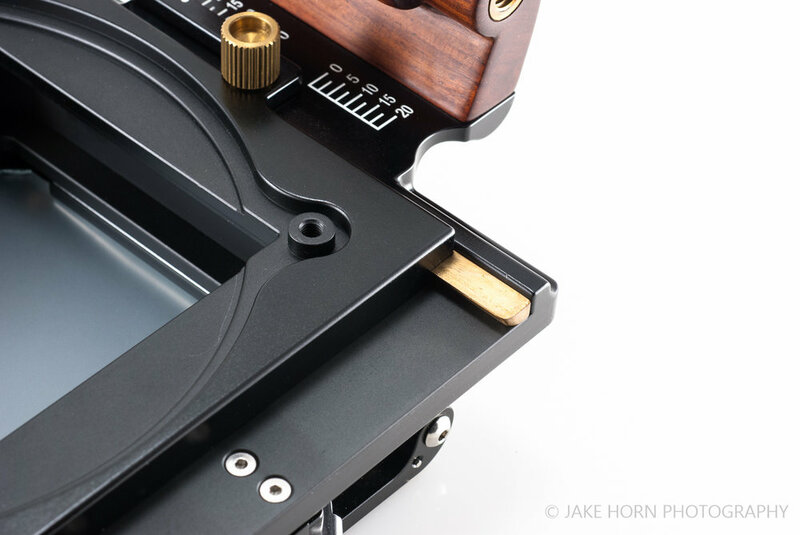 There's less variables to worry about, such as lens and film plane angles or position. While these additional movements are necessary in architectural photography, they are used in landscape photography less often. I want the camera to blend into the background while the real image capturing is done with a light meter and my mind. 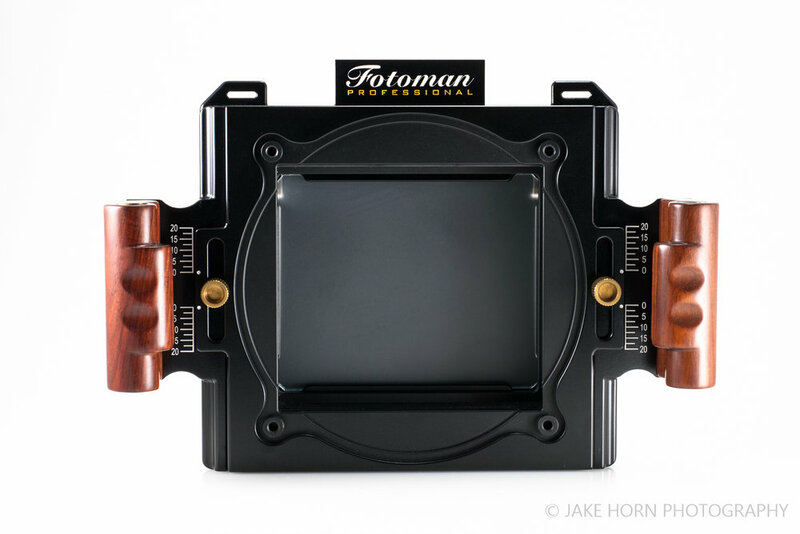 One issue I have with this version of the Fotoman 4x5 is that there is only one cold shoe (centered behind the logo). Point and shoots with multiple cold shoes allow you to use a viewfinder/rangefinder combo for more precise shooting. I have seen some with as many as three, so a light meter can be added as well. It would be nice to use a reflex viewer for this camera, but until I find one, I rely on the ground glass for composition. Fortunately, the flip up shade usually provides enough shielding to allow for image positioning. A dark cloth has been required on only one or two occasions, but I make sure to always have one with me. While the lens cone is great in wind and inclement weather, it also limits your choice of lens. It becomes impractical to travel with more than one lens and cone combination. The other disadvantage is that the cone can not collapse. This eats up precious space in even the largest camera bags. The longer the focal length, the longer the cone. So if you prefer a little more reach in your shots, this issue only gets worse. Mechanically, I have been very happy with both my Fotoman cameras. This 45SPS is solidly built, with tight controls and fluid shifting. The most prominent drawback to this system is the space required. Using my large F-Stop Shinn backpack, I can fit this comfortably with a second camera system. As you can imagine, the 4x5 accessories add up quick. While the camera itself is wider than your typical field camera, you also have to account for the film holders, light meter, focusing loupe, film changing tent, etc. If it weren't for the space requirements, I would be taking this thing everywhere. I will say, that unless you have a very wide lens, you won't be doing much handheld photography. While you could get away with it, not being able use a viewfinder and rangefinder makes hand holding a real shot in the dark. If you are ok with very slow contemplative shooting, I think a normal Toyo or Horseman field camera will be adaquate. But if your style requires something quicker and more durable, and you crave the look of large format, the Fotoman is the way to go.